I've had this ball for about 2 weeks now and all I can say is this Monster needs OIL!!!! If there isn't oil then the ball will burn up and use its energy quickly. I throw 17-20mph depending on lane conditions with 350-400 revs. I have to stand 10 boards left of center throw over 13 out to bout 8 and this ball comes back beautiful. If there is a lot of oil i just move right. Positives: Needs OIL, biggest hooking ball I've had to date, when it hits it hits HARD. Negatives: Burns up quickly if no oil, could of used a different drilling to make ball more versatile but ball still fits the bill for me. All i got say is WOW!! !, pin under ring finger cg kicked out with a weight hole. i throw with two hands two fingers over 400 rpm easily, bout 16 17 mph. and this ball is sick. biggest arc ever. i always wanted another lane #1 ball since my SCB died. and i have fell into heaven. 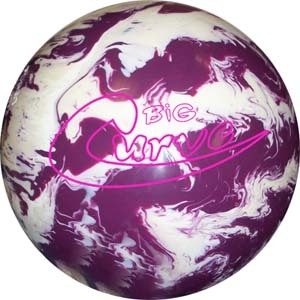 Got this ball in early November and this ball has increased my average from 176 to 188. I throw the ball really fast and found this ball I can swing out unlike my other balls I go down and in. My ball I got is 15lbs with top weight of 2.5 and a pin of 2-3. I use to average in the 200's a few years ago but did not bowl for 5 years so of course my average dropped. I hope to keep getting better with the ball as I use it more and increase my average. On my THS, this ball just does not stop coming. I have played it from 20-10, 15-5 and straight down 10. It just keeps hitting hard. I traded my Track 916AT for this, got the thumb plug, left it at box and this may be the best ball I have owned in 40+ years of bowling. Don't let the color fool you: It looks cool going down the lane. Page created in 0.658 seconds with 21 queries.